Another great issue by Rob Williams, but I have to admit I am getting less and less enthused by having to get through Romita’s art on the first half of the story. Eddy Barrows’ work is just so superior. The illustration of Captain Boomerang reflected in a beer glass is of such high quality that it really outshines anything Romita does on this book. I also loved the panel of Boomerang facing Enchantress and Croc. Just give the whole darn book to Barrows! 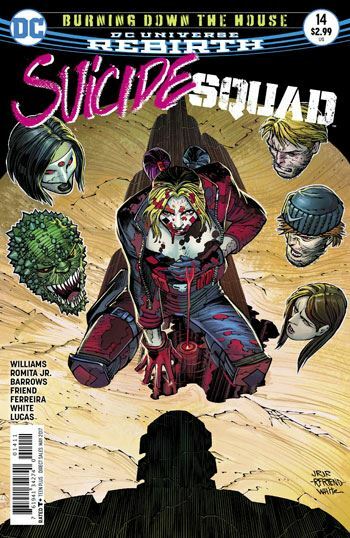 Anyway, that’s about the only complaint I have about Suicide Squad 14. 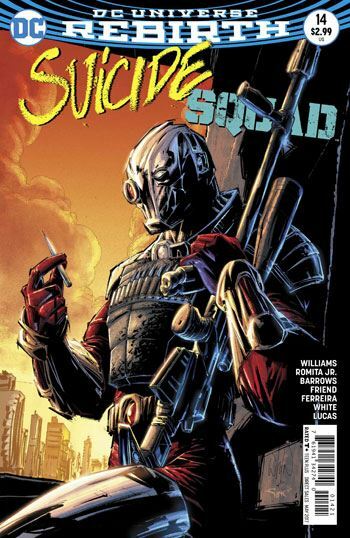 Harley Quinn is given an excellent role, showing far more depth and feeling than is generally associated with the character, as she rallies the remnants of the Squad to stand up to Deadshot and the rest of Rustam’s crew. In my review of the previous issue, I voiced a desire for some politics in this book, and lo and behold, that door opened in this issue! While in the Ostrander run, Rustam and his group, the Jihad, were essentially portrayed as a Muslim terrorist organization, though without ever dealing with religious fanaticism, here Rustam talks about global inequality and the control the 1% have. Rustam is being made into the kind of shaded villain that this book needs, a man whose beliefs and motivations are comprehensible, even if his actions are reprehensible. The same can be said about Captain Boomerang, revealed last issue as the traitor to the team, now that he has murdered Hack. It is always easy to hate Captain Boomerang, but we are also really getting a sense of how much he hates himself. A very good way to build sympathy for the character, without actually making us applaud his horrible acts. As for the ending of the issue. It was both a surprise, and something I had expected all along. Suffice it to say, I was very happy, and I believe other readers will be as well.